A fresh move of God is on the horizon! In the midst of fear, conflict, and unrest, a great Kingdom light is piercing through the darkness. Since the Day of Pentecost, this light of Holy Spirit outpouring has been increasing in brightness and will soon break forth in an unprecedented outpouring of supernatural glory. Are you prepared for what God wants to release in these last days? 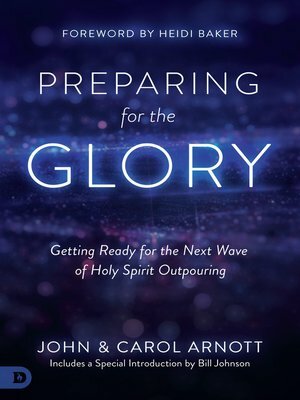 Preparing for the Glory is a groundbreaking new work from John and Carol Arnott that shares practical keys, gleaned from over 20 years of leading a global revival movement, that will position you to expect and experience this new move of God! Press in for deeper experiences with the Spirit by "feeding" yourself on supernatural testimonies of God's work. Prepare your life to be a resting place for the Holy Spirit in this historic hour of glory, presence, and miracles! "I believe that God will use the book to ignite the hearts of countless numbers of believers." "What John and Carol share is not revival theory, it's revival fact. What they did to position themselves for 'more of God,' you can do too." "John and Carol are the perfect people to share with us about what it looks like and what it feels like to see revival—both how to prepare and how to respond." "John and Carol Arnott will go down as two of the most extraordinary servants of God in the history of the Christian church. If Jesus tarries, historians will record the phenomenon that took place in the Toronto Vineyard Fellowship in 1994 as the beginning of an outpouring of the Holy Spirit that literally swept the entire globe."